Here's a clip of some new texture work in Thunder Moon, along with some flying around with the jetpack. I finally fixed a few lingering bugs related to normal mapping on the voxels, and the end result is I'm starting to like how they look now especially with dynamic lighting. The screenshot doesn't really do it justice, the video shows it off much more nicely. Unfortunately I had been using Fraps for something else recently and didn't reconfigure the settings to the usual, so there isn't sound and it was recorded at only 15FPS. For anyone wondering, on my mid-grade PC the game generally runs at about 80FPS and on the XBox 360 around 30FPS. There is still room for improvement but there's only so much that can be done with the XBox/XNA pushing around about a half million triangles every frame on average (not to mention the heavy number crunching of the animation blending system). The large caverns expose a lot of faces, many (most?) 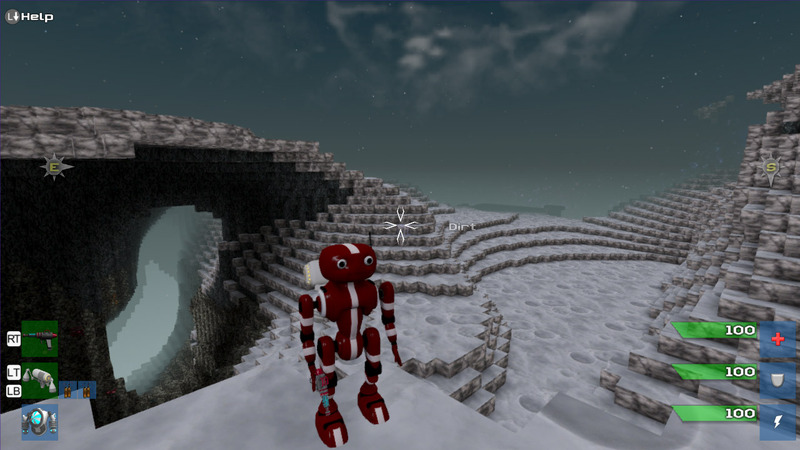 of them obscured by closer voxels, but it's worth it to be able to fly through the caves with the jetpack and vehicles.